My latest is up on the j.
Click here for Black-Eyed Pea Salad and Balsamic Borscht. I plan on writing more later today, I'm just running out the door and wanted to share! Update: Here's the recipes so there is no need to click on the link back to the j. weekly, however the post does go into more of the background on these recipes. Heat 1 Tbs. oil in a large sauté or frying pan over medium heat. Sauté garlic until light brown, add chopped chard and sauté until wilted and cooked through. (Add 1 or 2 Tbs. water if needed to the pan.) Season with 1⁄4 tsp. salt. Stir well and set aside. Combine black-eyed peas, carrots, celery and onion in a bowl. Toss well, add cooked chard and mix. Combine remaining oil, the rest of the salt, vinegar, lemon juice, black pepper, red pepper, cumin and hot sauce in a small bowl. Whisk together until blended. Pour into bowl with vegetables and combine. Add tomatoes and gently toss. Taste and correct seasoning. Garnish with chopped herbs. Serve room temperature or chilled. Heat the 2 Tbs. of vegetable oil in a large pot over medium heat. Sauté the onion until lightly brown. Add the chopped greens and sauté about 10 minutes until they are wilted and the stems are beginning to be tender to the bite. (Add 1 or 2 Tbs. water to the pan if needed.) Add the grated beets and stock. Stir and let simmer until greens and onions are cooked through. Taste and add salt and pepper. The amount of salt will depend on how salty the stock is. Stir. Add balsamic vinegar and 1 Tbs. of the brown sugar. Simmer a few minutes and taste. Add more vinegar or more sugar, if desired. Serve the borscht with boiled sliced potatoes, chopped hard-boiled egg, fresh, snipped dill and, if made with vegetable stock, sour cream or yogurt. The borscht is good served hot, warm, room temperature or chilled, but be sure to taste the soup at the temperature you plan on serving it and adjust the seasonings accordingly, since cold dishes tend to need stronger seasonings than warm ones. I’ll probably be adding some back story to this post later, but for now enjoy this recipe which is suitable for festive occasions as well as every day dinners. It is in no way or form an “authentic” cassoulet, but don’t let that worry you, just enjoy. Despite its full-bodied taste, the dish only cost about $5.75, or about $1 to $1.44 a portion. This recipe has been designed to made on a stove top, but if you want to cook yours in the oven or brown the bread crumbs at the end and have the means to do so, please do. While it will taste amazing freshly made it will taste even better if you give everything a chance to meld together, so it’s great for making a day or two in advance and reheating. Don’t add the bread crumb topping until right before serving, however. Leftovers are delectable. 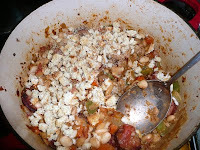 For another variation of my not-quite cassoulets, please check out this post. Slightly smoky, earthy and very satisfying, this savory bean dish is not quite a stew, not quite a casserole. My bargain tomatoes came in a large size can, so I divided them up between two recipes. 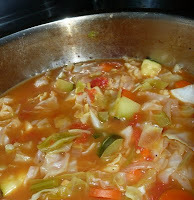 (This and the Sweet and Sour Cabbage Soup.) Your could substitute one smaller can. I cooked my navy beans from dried (99 cents a pound) and the cost of this dish reflects that. A one pound package of beans will cook up to about 6-7 cups, so you can add leftovers to your soup, throw together a bean salad, create a bean puree for use as a sandwich filling, make a white bean chili or freeze for another use. ½ of the whole, peeled tomatoes from a 28 ounce can of tomatoes in juice, drained and chopped (juice and remaining tomatoes reserved for Sweet and Sour Cabbage Soup or other recipe) OR 1 14-16 ounce can of whole, peeled tomatoes, drained and chopped and juice reserved for another use. While the cassoulet is cooking, toast the bread until it is golden brown. Wait until it cools and then finely chop into very rough bread crumbs. (Or whir in a blender, just be sure you don't puliverize your crumbs!) Crumble the remaining Italian seasoning with your fingers and mix with the crumbs. Right before serving, scatter bread crumbs atop cassoulet. If desired (and if you have used an oven proof pot), you can brown the crumbs slightly under the broiler. Want to make a more authentic cassoulet -- try the Amateur Gourmet's version with step-by-step photos? If you check out his photos you will see that, yes, it is true, you are not allowed to be a food blogger if you don't own a red-enameled dutch oven. (FYI - I got mine used at an estate sale, which is a good place to try to find these beauties at a price you can afford. The other place is discount stores such as TJ Maxx and Marshalls. They sometimes have seconds (usually finish issues) for half price or less. I got my blue oval one there. This is a go-to recipe that comes together very quickly. It is an adaption of a article and recipe I wrote based on a Vegetarian Times tortilla lasagna casserole on Wellfed.net a few years back. Here's the original from the February 2007 Vegetarian Times. You can read more about how I adapted the original recipe here. My adaption of my adaptation is below for an inexpensive, tasty, vegetarian and gluten-free dish for the Hunger Challenge. My version is made in the microwave. I estimate the cost is about $6 or $1 a serving depending on where you shop and if you use the optional garnish. I got an amazing deal on the cottage cheese ($1.29 for a pound), the grated cheese (two pounds for $4.99), the tortillas ($1.70 for 30), the sauce (99 cents for a 28 ounce can) and the frozen corn (79 cents for a pound) at the Grocery Outlet. Even if you can't meet those prices it is still a very economical dish. Heat oil in large skillet or pot over high heat. Add the onion, garlic and jalapeno and saute until soft. Add carrot and saute for a few minutes. Add zucchini and saute for a minute then add spinach and corn. Cook until vegetables are tender. .Season with salt and pepper to taste. Spread 1/2 cup of the tomato sauce over the bottom of a 9-10″ round casserole dish suitable for the microwave. Arrange 3 tortillas in a single layer (overlapping as needed) over the sauce. Mix the cottage cheese with salt and pepper to taste. Whip with a fork until the cottage cheese is a bit smoother. Spread 1 cup of the cottage cheese over the tortilla layer, top with another 1/2 cup of the tomato sauce, 1/2 of the vegetable mixture, a third of the cheese. Repeat laying with 3 more tortillas, 1 cup cottage cheese, 1/2 cup tomato sauce, another third of the cheese. Place remaining tortillas on top and spread remaining tomato sauce over top. Sprinkle with rest of the cheese. Place in microwave and heat on high for about 15-20 minutes until the cheeses on top have melted and the lasagna is heated through. Garnish with chopped cilantro if desired. First a confession -- while I'm developing recipes and menus for the week-long Hunger Challenge, I'm not really following it for a consecutive week. Business, personal, professional and travel commitments made that unwieldy. What I am doing is following the food "budget" of $4 a day whenever I can, including today. Under the guidelines from the San Francisco Food Bank, the Hunger Challenge's sponsor, that is allowed. In the morning I was out running an errand and I was dreadfully thirsty. I forgot to fill my reusable water bottle. I couldn't spare a dollar for a bottle of water, that literally would have taken food out of my mouth. After work, I decided to run out and price ingredients for my menu and shop for some of them at the Grocery Outlet. I shopped until after 8 p.m. and I was starving. There were tempting taco trucks and a southern bbq wagon right by the store but after I priced what I could eat on the remaining budget for the day, I took a pass. I barely said hi to my husband after I returned home before I wolfed down my dinner portion. I was so hungry that it really affected my ability to make decisions in the store and drive home. For me it was a very dramatic and unfamiliar example of what it is to be hungry and try to function at a job or educational environment. A word about the Grocery Outlet. If you are unfamiliar with this chain, I urge you to check it out. There are real values among popular national brands as well as unfamiliar store brands, near-expiration date refrigerated products and failed-to-sell frozen foods. The chain also carries fresh dairy, fruits, meats and vegetables. You do have to know your prices a bit on some stuff, but most foods are good deals. The store I shopped had everything from organic canned tomatoes and other canned and packaged "health" foods to 10 pound bags of poatoes for $2.54, Be careful though there were also such things as "jumbo" bowls of ramen noodles with almost half of a day's sodium in a single serving. Check out the store's website for "bargainista" tips and locations. One caveat: You need to be flexible. The only vinegar I saw this trip was balsamic and while it was a deal it wasn't part of my food planning or budget. I wanted to buy one head of garlic, the store only had larger packages. I was revising my menu on the spot or making decisions to make another stop and shop elsewhere to stay with the plan. I was particularly impressed with some of the fresh fruit and vegetable prices. I can work much more of that into this year's challenge than last. (Of course have $1 more a day per person makes a big difference, too.) Bargain food shopping is work, you can't just pick what's appealing or easy. Keeping in mind nutrition and developing recipes that don't take all day to cook have to be considered, too. Watch for future shopping installments about ethnic markets, 99 cent and dollar stores, and farmer's markets. Dinner tonight was baked chicken thighs on a bed of tomatoes and potatoes. Recipe to come. To read more about my participation in this year's Hunger Challenge, click here, including links to the participants and more. For links to last year's recipes, shopping lists, etc., click here. Here's a list of bloggers taking the hunger challenge. I hope you will check them out as well as the official Hunger Challenge blog site . Been There Ate That - 2nd year! Beets and Biscuits - New! Blog Appetit - 2nd year! Cooking with Amy - 2nd year! Heat Eat Review - New! Hoos on First - New! I Do Not Think That They Will Sing To Me - New! Maria Niles - 2nd year! Michael Dimock - Roots of Change - New! Midtown Mark's Hunger Challenge - New! Muse in Vivo - New! My Life in Food - New! Petit Appetit - 2nd year! Poor Girl Eats Well - New! Some Dreams Come True - New! Stellajade by Sarah W - New! The Guerilla Gourmet - New! The Inadvertent Gardener - 2nd year! Vanessa Barrington - 2nd year! Last year for the San Francisco Food Bank's Hunger Challenge I devised a variety of interesting and hopefully nutritious breakfasts -- spinach and scrambled eggs, whole wheat waffles with peanut butter and jam and even pancakes with caramelized apples. This year, I'm aiming to keep the amount of cooking lower in my "menus" and the breakfasts reflect how I truly eat. For 14 breakfasts (seven days for two people), I will be spending a total of $8.17, leaving me a total of $47.83 for the other 28 meals (seven days of lunch and dinner for two). That $8.17 covers the cost of a high fiber cereal ($2.99 for 10 one-cup servings), four servings of oatmeal (at about $.15 per serving that would be $.60), a quart worth of milk (half of the half gallon or about a dollar's worth) and seven bananas ($1.40 at about 20 cents each), figuring a half a banana per day per person. I also added in a half cup each daily of frozen, reconstituted, calcium enriched orange juice (about $1.18 worth of the juice). This is closer to what I would regularly eat and I imagine would be realistic in most households most mornings. These items were purchased at Safeway and Trader Joe's. If you would like to see the breakfasts we ate last time with recipes, shopping tips, etc., please click here. Last year's challenge only allowed us $1 a person per meal a day -- $3 instead of $4, which is a temporary increase. I can't begin to tell you what a difference that extra $1 a day a person made to my menu planning. Hunger Challenge participants can also this year draw on a "typical" pantry contribution of vegetables, staples and more. I've decided to make those meal add ons and/or alternatives and you'll see them marked as such. To see other posts on our participation in the 2009 Hunger Challenge, click here. Be sure to check out the San Francisco Food Bank's Hunger Challenge official blog for info on what other food bloggers, media personnel and others are doing as they participate in the Hunger Challenge. Also last year, Tyson donated five truckloads of food to Bay Area food banks as a result of comments made on its blog in support of the Hunger Challenge. This year, by blogging and tweeting facts about hunger in America they will donate food to the agencies. It's 100 pounds for each tweet and 500 pounds for each blog post. To pass on the word and help get the food, check out this post on the Tyson Hunger Relief blog. Below are just a few of the facts from the Tyson post about hunger in America. Please go to the post to see more. If you are not a Bay area resident, I encourage you to go to the Feeding America site to find a link for a food bank in your area and learn how you can help in your community. I love hands-on cooking workshops, especially those were I can get real close and personal about an ethnic cuisine I love to eat. I won't be able to go to these Mexican cooking classes in San Jose, CA , Friday and Saturday, 9/25 and 9/26 sponsored by the Mexican Heritage Corporation in association with their mariachi festival. More info here. Classes include dishes from tamales to paletas (fresh fruit ice pops). 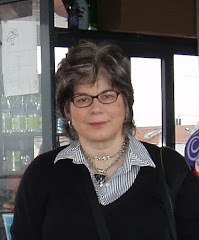 Thanks to Moxie Girl 858 for deciding to follow Blog Appetit. Moxie Girl is a relatively new food blogger with a great attitude and a zippy writing style, I hope you'll check her out here. I love her attitude which seems to be there is always a reason for us to eat cake. Check out my latest column at the j. weekly. It focuses on the local tradition of donating non-perishables to local food banks during the Jewish High Holy Days and has two recipes that use canned goods themselves -- cranberried chicken and tuna and chickpea salad. The cranberried chicken makes the best leftovers. The recipe is great for the high holidays as well as a regular Shabbat or other dinner. I love the contrast of the juicy, savory dressing-like bread layer and the tart and sassy cranberry layer. I hope you'll try it and let me know what you think. The make-ahead tuna salad works well for Yom Kippur break fast. It works as a salad or sandwich filling. You can see the recipes and write up here. To find a food bank in your area (guaranteed they will be looking for donations), please go to Feeding America . 2009 Hunger Challenge Debuts -- Could You Eat for $28 a Week? Once again I am participating in the San Francisco Food Bank's Hunger Challenge -- an invitation to bloggers and others to share in the experiences and challenges faced by those on limited food budgets and food stamp users. For more info on the challenge, please click here. For information on the S.F. Food Bank, click here. To see my contributions, recipes, menus and shopping list for last year's Hunger Challenge, click here. All during the month of September: Macy’s has joined with the San Francisco Food Bank and Feeding America (the national organization of food banks), to encourage people to host dinner parties – with guests making a donation in lieu of a hostess gift. At http://www..macys.com/cometogether, you can send invitations, find recipes, manage party details and make donations that will go directly to alleviating hunger. If you’d like to participate without throwing a dinner party, donations can be made directly at any Macy’s register – with $1 providing dinner for seven hungry people! Wednesday, Sept. 16, 6 pm: Chef Ming Tsai hosts a special dinner party at Macy’s Cellar, Union Square , with all proceeds going to the San Francisco Food Bank. Ming Tsai, star of the public television show Simply Ming, will prepare an East Meets West Feast of his signature dishes, including pork and shrimp pot stickers, Asian-style sliders and much more, accompanied by wine and a casual cooking demonstration; $25. Sept. 20-26: Could you eat for just $28 a week? The San Francisco Food Bank Hunger Challenge asks participants to survive on a food stamp budget of just $4 per day, then share their experiences via blogs, Twitter, Facebook and other media. Do it for a month, or even a day. Or, host a Hunger Challenge dinner party – spend just $1.33 per person and donate what you might otherwise have spent on food. Get more info and sign up at www.HungerChallenge.com. Tuesday, September 29, 3 pm - 7:30 pm: Help fight hunger in San Francisco , by dropping off non-perishable food items at the SF Food Bank warehouse on “Take it to the Bank” Day. As a special treat for anyone who makes a donation, food cart vendors will be selling their wares outside the Food Bank, at 900 Pennsylvania Ave. (cross street 23rd St. ) Other drop-off days will be October 21, November 3, December 19. All month: Check out the many ways you can help fight hunger in our city with SF Food Bank’s “30 Ways in 30 Days” interactive calendar at http://bit.ly/12KzuW. Not a S.F. or Bay area resident -- find your local food bank agency here and find out how you can help the hungry and raise awareness in your community. There has been a bit of a southern renaissance in Oakland, or at least my awareness of the southerneness that has shaped the city's tastes and politics has been kicked up a notch. There are at least two gourmet "soul" food restaurants now in Oakland with others on the way. Oakland has always been home to more neighborhood places and several renown barbecue stands. (My family has always been partial to Everett and Jones, but Flint's is good, too.) Today, walking to the farmer's market from my car I noticed the Latin American tapas place had closed and was being replaced by another upscale Southern food restaurant. Across from the market I saw the French crepe place had morphed into a soul fusion cafe. The farmer's market at the Grand Lake/Lakeshore Splashpad Park had several stands brimming over with green pint baskets of fresh and succulent okra, a staple of southern cooking, as well as in Indian and other Southeast Asian cuisines. But I also saw a basket full of paw paws, a fruit much like the cherimoya or custard apple that ranges through the south to parts of the Midwest. I have read of paw paws in food histories as well as seen fiction and non-fiction references but it was my first time face to fruit. These specimens (sorry I didn't take a photo) were the size and shape of small russet potatoes with a greenish yellow skin turning brown in spots. It was almost funny with stands full of such exotica as homemade goat cheese, Afghan delicacies, and variety after variety of Asian greens, that it was the humble paw paw that captured my imagination. It also got me thinking about Oakland and it's ties to the American South. I don't want to get too scholarly here (nor do too much research), but it was the Depression and WWII war-effort employment that brought African-Americans and others from the South to Oakland. The powers that be were aghast at the what this influx of mostly Democrat voters would do to their Republican (and white) bastions of power in the city. One result was a change in the city government in Oakland, with a strong council and city manager and a weak mayor. There is so much more to say about this topic, but I don't have the inclination to do the research right now. In the meantime, please enjoy my okra with tamarind sauce. The okra came from a Central Valley farm stand my husband stopped by earlier this week. The recipe is more Thai or Indian than Southern, but it was the okra that started me thinking about the debt this city owes its transplanted Southern roots. In a way it fits in with this post, because it owes much to all the different ethnic influences that thrive here in Oakland.